We pilgrims are enjoying Redemptorist spirituality and hospitality! Friday morning we stopped for Mass at the Cloister of Sts. Maria and Radegundis. Dating to the 8th century, it’s located at Gars on the Inn River, east of Munich. Since 1858 the monastery complex has been under direction of the Redemptorists. Priests and brothers here labor at several jobs, including educating young people and cultivating herbs, flowers, and vegetables. In the ornate and gilded chapel (where Monsignor Bastress tried his hand at the organ in the loft) lies the tomb of young Kaspar Stanggassinger, a Bavarian native beatified in 1988. The beloved prefect and professor at the Redemptorists’ minor seminary died in 1899 at the age of 28. "To preserve and to develop the vocation of the students," he once wrote, "is more than converting the greatest of sinners, and more than preaching the brilliant missions." 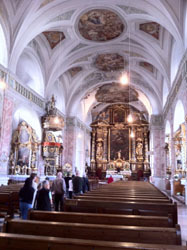 From Gars, we traveled s short distance east to Altötting, a site of Marian pilgrimages for the past 500 years. Prior to his departure for America, Blessed Francis Seelos spent time here when the place served as the Redemptorists’ provincial house. Parts of Gnadenkapelle, the Chapel of Grace, date to the 8th century. The small chapel holds a 28-inch high statue of a Black Madonna and Child that dates to 1350. Our Lady’s intercession is still sought for healing of body and soul. Petitioners and penitents pick up arm-sized wooden crosses and, in silence, circle the outside of the chapel. The outer walls are lined with hand-painted images from thankful pilgrims, some new and vivid in color, others centuries old and darkened by time and the elements. From Altotting, we boarded our bus and headed for Salzburg, about 50 miles south and just across the border in Austria. We’ve spent a lot of time on the bus the last three days. We’ve prayed the rosary and morning prayer together, and the rides have given us a taste of the charming Bavarian countryside. There’s a sense of calm and quiet that was evident from our first arrival. Pocket-size chapels dot the countryside – one was set back in the middle of a field in the shade of a single tree. We’ve been treated to acres of Alpine grazing meadows overlaid with delicate patches of wildflowers. Passing through one area, we even came across a horse auction in progress on the side of the road, complete with several buyers dressed in traditional lederhosen. If ever you sample the charms of Salzburg, you’ll want to return. The town of about 150,000 suffered little destruction during World War II, and offers a pedestrian-friendly "old town" rich with history and culture, plazas and churches, sidewalk cafes and charming shops, some dating back centuries. It’s located on the Salzach River in the shadow of the snow-tipped Alps. Stately old homes line the riverfront, and a medieval fortress on a crag overlooks the historic heart of the city. Archbishops once ruled Salzburg as an ecclesiastical principality. They introduced Italian Renaissance architecture and commissioned the finest musicians and artists possible to compose, create, and perform what we today would call faith-based works of art. That’s the world that shaped young Wolfgang Amadeus Mozart. Our excellent tour guide walked us through square after square to the magnificent Salzburgerdom (the city’s cathedral), built between 1614 and 1628. Just before we entered, the bell tower of one nearby church tolled the hour, then another chimed in, then another. The influence of the "Catholic imagination" greatly enriches this jewel of a city. The largest church in Austria, St. Stephen’s Cathedral (Stephansdom) in Vienna, bears scars of more than one war and fire. It was damaged during the Turkish siege of 1683, and again in 1945 as World War II neared its end. 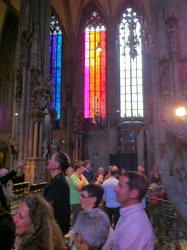 Most visible interiorly are the dozens of tall, narrow Gothic windows. Other than the set behind the main altar, most of the image-rich stained glass was lost and replaced with plain-colored glass. Among the dozens of images and side altars, one stood out for us: the statue of Clement Maria Hofbauer, a Redemptorist and patron saint of Vienna. Charged with extending the Congregation north of the Alps, he was stymied by Austrian Emperor Joseph II who closed 700 monasteries. Hofbauer lived the last 12 years of his life in Vienna. Shortly after his death in 1820, Emperor Franz Joseph turned over to Hofbauer’s Redemptorists the lovely church of Maria am Gestade (St. Mary on the Strand), where we ended our day with Mass. The Redemptorists flourished in Vienna, and from there they directed bands of missionary priests to America and became a worldwide religious congregation. 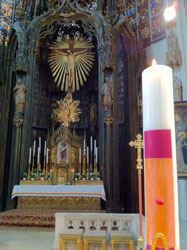 St. Mary’s on the Strand (so-called because of the branch of the Danube that once flowed there) houses Hofbauer’s remains in a side altar along with the marble cover of what was once his elevated sepulcher. It’s also still the home of the provincial of the Redemptorists’ Vienna Province. The church is Vienna’s second oldest, quite narrow now as it was extended from an earlier building. Still the High Gothic style offers a handsome alternative to the omnipresent Baroque of later Austrian church design. Redemptorist brother Thomas Marzik created the main altar, a magnificent neo-Gothic style with a large cross, in the mid-1800s. According to the booklet on Hofbauer provided the pilgrims, an archbishop of Vienna credited Hofbauer with re-awakening church life in Vienna: "He gave a new orientation to the age, and only after his work can we begin again to speak of Vienna as Catholic." Today (Monday) we began the last leg of our pilgrimage – in the Czech Republic, the homeland of St. John Neumann.